Working closely with Björk and her team we designed spatial sound systems for a retrospective of the artists work at The Museum of Modern Art New York. Compiling mixing and sound designing at our London production studios, fine tuning and mixing on site in the installation at MoMA. Object based, point source, planar wave, ambisonic and discreet	audio files were decoded to a 3D soundfield we created for the	commissioned piece “Black Lake”. The specially constructed David Benjamin interior designed room with films by Andrew Huang opened to the public 7 days a week for 3 months. Collaborating with Barco Iosono and B&W we built dedicated hardware control and operating systems. 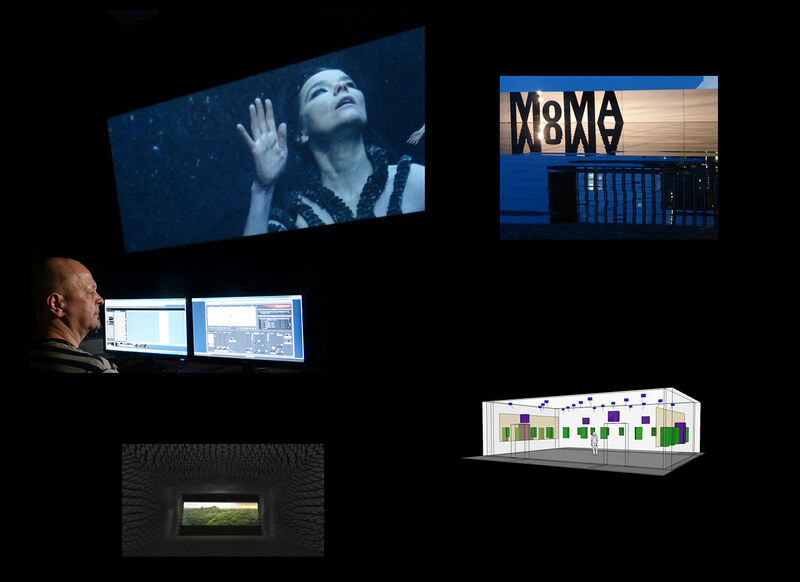 The critically acclaimed sound design was produced and mixed by Marco Perry for Immersive Audio Ltd. We also designed and installed a spatial audio surround sound cinema system for the artists video output showing in another area of MoMA.